Warranty: Every Mpow product includes a 45 days money back & 18-month warranty. Description: . Trending at $20.20eBay determines this price through a machine learned model of the product's sale prices within the last 90 days. Warranty: The Mpow product includes a 45 days money back & 18-month warranty. Features： 1.NEWLY ADDED CONVENIENCE--Vibrating Call Alert & Carrying Bag: Mpow Jaws has upgraded its version to the Gen-5, which can vibrate independently when a phone call comes in and provides a hard protective carrying bag for your convenient and secure storage. Vibrating Call Alert can avoid missing incoming calls in case that the earplugs are not in your ears while in Bluetooth connection. .
Warranty: Every Mpow product includes a 45 days money back & 18-month warranty. Description: Charge on the go: The Mpow TWS Bluetooth earbuds can work for 3.5 hours from a single charge. Charging case can fully charge earbuds for 5-6 times. Thus say goodbye to power off, and enjoy the 21 hours of total playtime. Note: The Charging box works as the power bank to charge your phone when necessary IPX7 Waterproof: The upgraded IPX7 water protection ensures the Mpow bluetooth earbuds resistant to sweat, water and rain, making it an ideal company while running, jogging, yoga, exercising, fitness, travelling and etc. Warranty: Every Mpow Product includes a 45 days money back & 18-month worry-free! \ Features: UPGRADED BATTERY FOR 10-12H PLAYING: Mpow has improved the battery capacity from 100 to 120mAh, providing you 10-12 hours music time and nearly 14 hours talking time. The upgraded hardware of the motherboard gives you more stable & reliable charging experience. Bass Technology and Full range High-quality Audio: Premium CSR chip and professional in-house engineers, together with imported copper wire allows you to enjoy all the subtleties in your music. 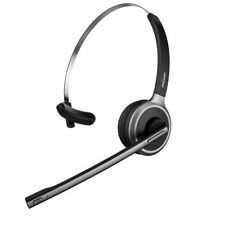 Features: Clear Conversations & Natural-Sounding Audio -- You will get the hear-and-be-heard advantages of a Mpow headset, thanks to advanced undirectional noise reduction microphone technology and fast stable Bluetooth V4.1 transmission. Lightweight Comfort All Day Long -- The headset weights 0.11lb (lightweight as an egg). With breathable protein earmuffs, the headset gently hug ear and allow you to wear for hours at time without getting a headache or sweaty ears. Up To 13 Hrs Talking Time -- 180mAh battery offers up to 13 hours continuous talking time/ 11 hours music time (Full Volume)/ 160 hours standby time with a single charge of 2 hours. .
Mpow Bluetooth Headphones Over Ear, Hi-Fi Stereo Wireless Headset, Foldable, Soft Memory-Protein Earmuffs, w/Built-in Mic and Wired Mode for PC/Cell Phones/TV. We Brought You a Luxurious Setting with Mpow D3 Bluetooth Headphones and Highest Quality Materials Sport Armband For the Sports Armband： The Highest Quality Materials This water-resistant sports armband is made of a blend of top quality soft Neoprene and Lycra that is made to flex, twist and bend but does not stretch out of shape. Soft, Thick and Plush Velcro elastic band Providing you more flexibility for fitment and comfort. 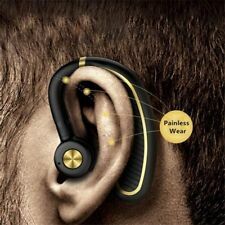 It can stand up to the toughest of workouts and marathons. .
Mpow T6 Truly Wireless Earbuds IPX7 Waterproof Level Resistant to sweat, water, and rain. Perfect for both indoor enjoyment and outdoor activities, such as yoga, jogging, traveling, fitness, and etc. Extended Battery Life With Low electric loss, the Mpow earbuds can support 3.4 hours playtime from a single charge. The Charging case can be fully charged within 2 hours, when full charged, it can recharge the earbuds for 5-6 times. 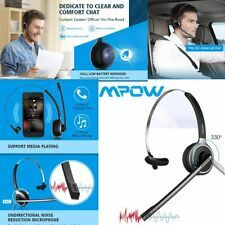 The Charging box works as the power bank to charge your phone when necessary. .
Mpow H10 [2019 New Version] Active Noise Cancelling Bluetooth Headphones ANC Over-Ear Wireless Headset Foldable Headphones w/Powerful Bass (CVC 6.0 Noise-Cancelling Dual-Mic Soft Ear Cushions 18-25Hrs) Excellent Active Noise Canceling Dual-Mic Mpow H10 headphone adopts feedforward feedback dual-mic ANC tech to drown the noisy surroundings out of your ears. Long-lasting Companion With up to 30 hours play time (with ANC off), you can enjoy the continuous music entertainment from day to night. 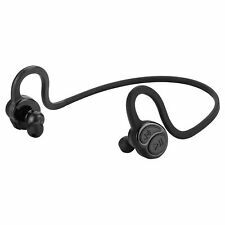 Premium Bluetooth Thanks to stellar CSR8635 chip, stable connection and astonishingly high-quality audio are achieved at ease. . Features: 1. Caller ID Report: Announce Coming Caller's Phone Number, Pause Music for InComing Calls. 2. Voice Recognition: Manage Calls Handsfree Without Pressing Buttons Through Voice Recognition Technology,Just Say "Yes" to Answer or Say "No" to Refuse call. 3. Noise Cancelling Technology: Triple Mic Technology Cancels Background and Wind Noise When in Crowds. 4. 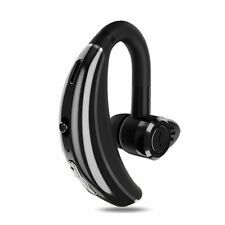 Sweatproof Technology: Protects This Bluetooth Headset from Sweat, and Coffee Spills so You Can Wear the Headset in the Office or at the Gym. 5. 180°adjustable Ear-fit design allows you to adjust the angle to fit on your right or left ear..
Bullet Points: 1. Advanced CSR Chip. The premium CSR chip brings you amazing stereo sound quality. Ensure stable signal transmission for hassle-free conversation and enjoyable music playing. Support mute function as well. 2. Streamline Design with 180°Rotable Earbud. Stylish design allows comfortable wearing. 180° adjustable earbud fits perfectly for your left or right ear. 3. Bluetooth4.1 Technology. Easy and fast pairing with smartphones, tablets and other Bluetooth enabled devices. Enjoy audio quality with enhanced clarity. . The Video instruction of this product: 1.NEWLY ADDED CONVENIENCE--Vibrating Call Alert & Carrying Bag: Mpow Jaws has upgraded its version to the Gen-5, which can vibrate independently when a phone call comes in and provides a hard protective carrying bag for your convenient and secure storage. Vibrating Call Alert can avoid missing incoming calls in case that the earplugs are not in your ears while in Bluetooth connection. .
NATURAL HD SOUND: Finely tuned neodymium driver 40mm stereo driver together with over-the-ear ear pads provide immersive listening experience in natural sound. LIGHTWEIGHT & COMFY FOR PROLONGED WEARING: Weighs 7.5oz (212g), Made of Lightweight yet solid materials, improved structure, Mpow H1 is much lighter(10%-30% lighter) and more comfortable than the most mpow over ear/ on ear headphones and other brands. WIRELESS AND WIRED PLAYBACK: Extended battery capacity provides 15-20hrs music/call in wireless mode, What is more, you can proceed to enjoy music via the provided 3.5mm audio cable when the battery is low. .
Mpow H7 Bluetooth Headphones Over Ear, Stereo Wireless Headset with Microphone & Comfortable Memory-Protein Earpads & 18 Hours Playtime & Wired and Wireless Headphones for Cellphone/Tablet Features: HEAR IMPRESSIVE SOUND: Finely tuned 40mm driver units and CSR chip give your music the rich, powerful sound it deserves ALL-DAY COMFORT: Memory-protein ear cushions and adjustable headband allow for comfortable all day listening. Swiveling earcups make it easy for you to put them to lay flat on a table or around the neck when not in use . Warranty: Mpow product includes a 45 days money back & 18-month warranty. Clear Conversations & Natural-Sounding Audio -- You will get the hear-and-be-heard advantages of a Mpow headset, thanks to advanced undirectional noise reduction microphone technology and fast stable Bluetooth V4.1 transmission. Lightweight Comfort All Day Long -- The headset weights 0.11lb (lightweight as an egg). With breathable protein earmuffs, the headset gently hug ear and allow you to wear for hours at time without getting a headache or sweaty ears. .
Every Mpow Product includes a 45 days money back & 18-month worry-free! 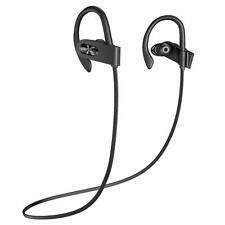 Features: IPX7 SWEATPROOF EARPHONES: Mpow IPX7 Water-resistant Nano-coating efficiently protects sport headphones from sweat and ensure more guaranteed life span, perfect for running, jogging, hiking, yoga, exercises, gym, fitness, travelling and etc. .